Nearly 400 pages of swords, magic and action! After a small fortune is spent on getting him into a fantasy game, Eric Templeton expected to last longer than 30 minutes. Instead of being spawned into a newbie village he was accidentally sent to the darkest regions of the map, where creatures beyond his level roamed. Eric stumbled upon a conspiracy amongst some high-level players where they planned to break the only treaty that guaranteed peace in the land, and find the shards that would allow them to summon Necrolor, the most feared player in the game. Together with a giant called Brian and a dwarf named Smoglar, Eric is on a quest to get revenge on Herelius Rouge, the powerful warrior who killed him in his first playthrough. If he’s successful he would also stop Herelius from bringing Necrolor back to life, but saving the world is just an added bonus. This is all about revenge. Janus has a long journey ahead of him if he is ever to become powerful enough to kill Herelius. 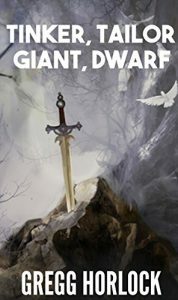 A fantasy series with an epic world, filled with quests, battles and adventures.